One of my most cherished memories of my childhood is the joyous time spent with my family in my paternal grandparent’s palatial home during Diwali, a festival celebrated throughout India in late October and early November. Diwali comes from the Sanskirt word Deepavali, meaning ‘row of lamps’ and is celebrated at the end of dark fortnight of Amavasya or the waning moon. Just like any other dozens of Hindu festivals, the planning and preparations for the festival starts weeks before Diwali. The colourful lanterns, intricate rangoli, glittering diyas, new cloths, boxful of sparklers and fireworks, stacks and boxes of delightful sweet treats and the most amazing festival meals are integral part of this festival of lights. Diwali is a time of remembrance, togetherness, fireworks, joyous, feasts, forgiveness, renewal and celebration of life. I just have to close my eyes for a brief moment to take me back in time, to the time of my childhood. I can clearly see my mother and my aunts working together in a large family kitchen preparing the feast for our large joint family members and for the steady flow of guests who will arrive throughout the day. The large house is dusted and swept until every nook and cranny sparkles when the sun rays touch them. The sacred prayer room is swept and swabbed until it gleams from the light shining bright from the large brass and silver diyas. The copper and brass vessels are scrubbed clean using tamarind and wood ash until every disapproving mother in law can see her face quite clearly as she can in the Belgium mirrors on their Burmese teak wood almirahs! The front yard was cleaned and then painted with the thin coat of cow dung before decorating it with rows of rangolis in intricate designs and rainbows of colours. The main door was decorated with strings of marigold and jasmines and a thoran made by stringing mango leaves. New Kancheepuram silk sarees in beautiful rainbow hues and silk veshti and shawls for the daughters and son-in-laws of the family are gift wrapped in colourful boxes. The men got busy wrapping the gold jewels and silk sarees for their wives and the bagful of new clothes, toys and fireworks for the kids. The elders in the family took in charge of buying new cloths and boxes of dried fruits and nuts for relatives and friends, as well as making sure that the plateful of sweets were kept ready for the steady stream of gusts visiting the family to wish. We kids were in charge of the most important task for the festival and that was to clean hundreds of clay lamps that were kept in the wicker basket up in the attic. After cleaning thin coat of dust from the little diyas, we soaked them in a large bucket of water to prevent the oil from leaking out and then arranged them on the terrace to dry off. As the sun turned the sky crimson and set behind the hills in the distance, we lined all the clay lamps up along the verandas, driveways, on the windowsills, and in the open courtyards. The little lamps were also arranged around the Tulsi, the holy basil plant, and around the beautiful rangolis. Once all the clay lamps were lit and the bright electric lights were turned off, every family member gathered in the open courtyard to enjoy the company of one another. The evenings lit only by flickering clay lamps and candles, the heart seemed to grow fonder as the misery, sadness and hatred somehow dissolved in the softness of the light. The voices become quiet, the smiles become bright, and the soul becomes lighter! Even the most active and mischievous kids in the family seemed to go quiet at the sight of hundreds of little lamps illuminating in the darkness and transforming it into a magical land! Free of the harsh, blinding and joyless light of electricity, we at last find the peace and joy in the company of our loved ones that surpasses everything that a material world has to offer! This year like last year we will be celebrating Diwali with some of our close friends. We feel blessed to have made some great friends in this country who have become more of family members over the years. This Diwali we will gather to light the lamps, set off fireworks and chat about passing years. And there will be food, glorious food which is sure to add few inches to our waistline. The menu is almost set and the shopping list for the ingredients is almost ready. 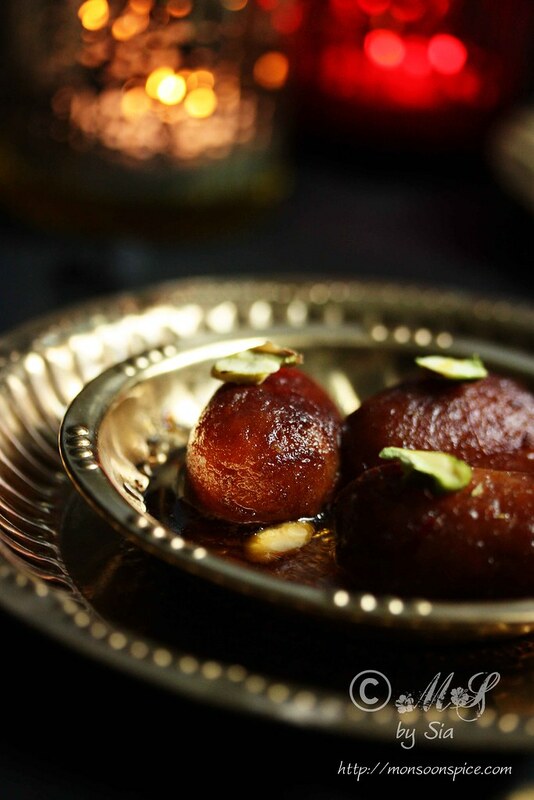 As the name suggests, the term Gulab Jamun comes from Persian words gol (rose) and āb (water), referring to the rosewater-scented suagr syrup, and hindi word jamun, an Indian deep purple coloured fruit with a similar size and shape. 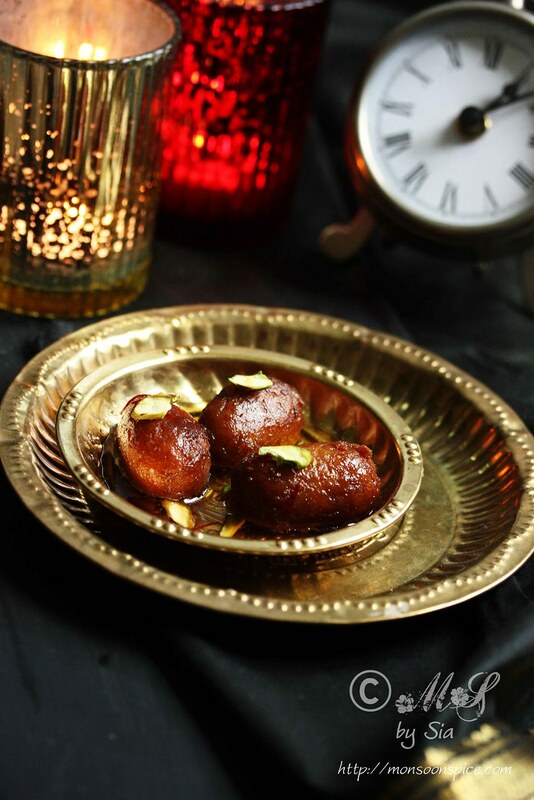 Traditionally the Gulab Jamuns are deep fried in pure Desi Ghee to golden brown perfection. But with my ever expanding waistline giving me few nightmares, I have used oil instead of ghee for frying. 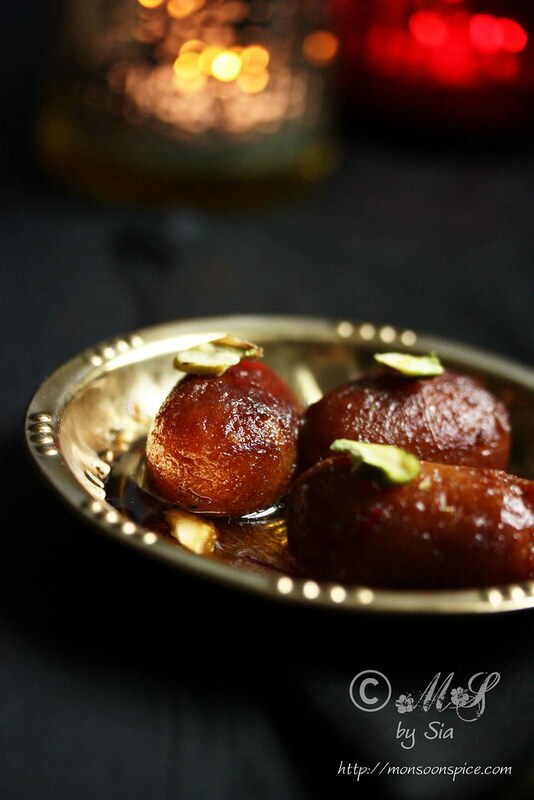 Gulab Jamun is made mainly from milk solids, traditionally by freshly curdled milk solids known as Khoya. The milk solid is kneaded into a dough with few tsps of flour as a binding agent, and then shaped into small marble sized balls and deep fried at a low temperature. The balls are then soaked in a sugar syrup flavoured with crushed green cardamom and rosewater, kewra (essence from Ketki flower) or saffron. 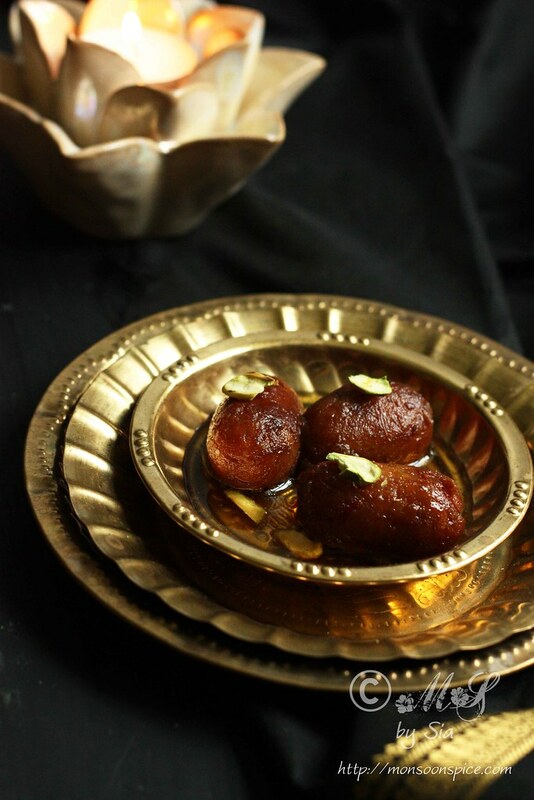 The recipe I am posting today is made using milk powder and is rather a simple way to make Gulab Jamuns at home. 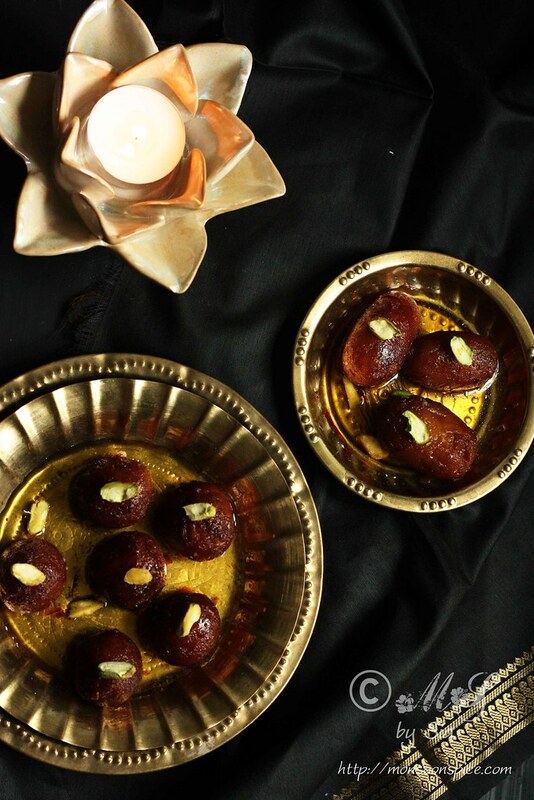 Although the process of making Gulab Jamun is quite simple and straight forward, there is no denying the fact that it is also little time consuming. If you keep in mind few points, you will end up with a melt in mouth sweet dumpling that will redefine the very definition of deliciousness! 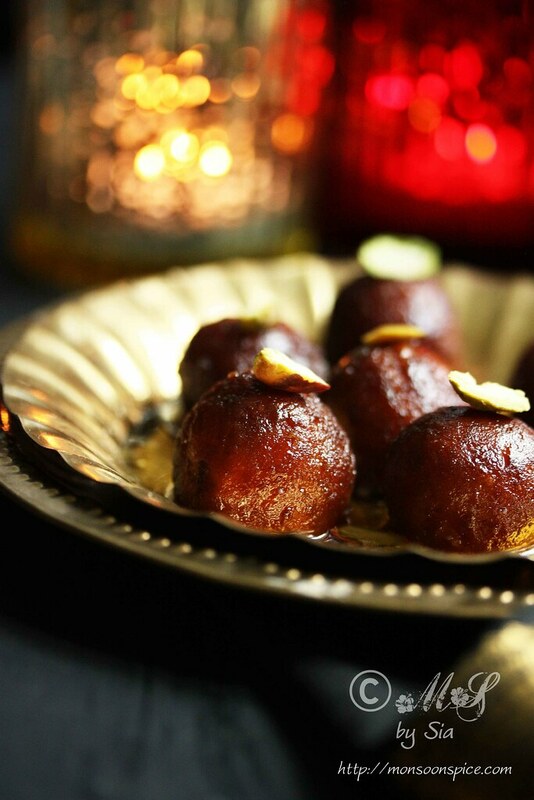 Gulab Jamuns are sinfully sweet, succulent and soft dough balls, smothered in sugar syrup. 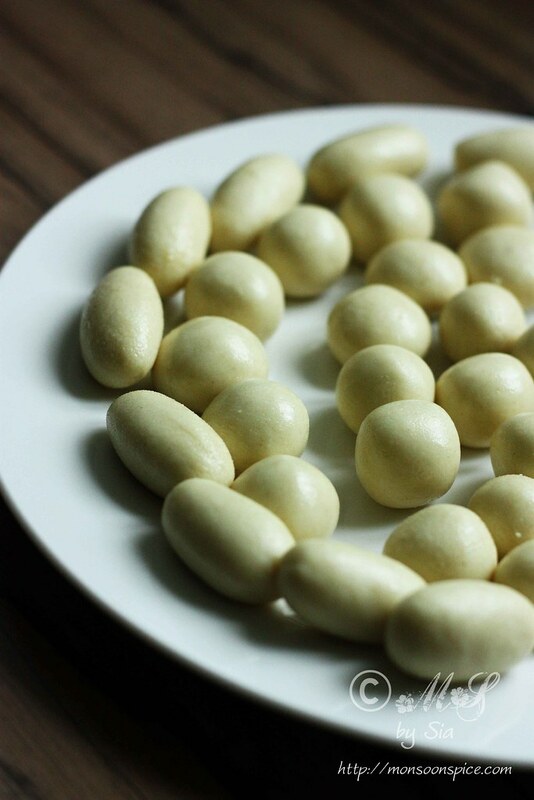 Whether you serve them as a dessert at parties or simply want to indulge yourself, this traditional Indian sweet is the one for you and it will never disappoint your taste buds! Add sugar and water in a wide pan and heat it on a medium flame. Once the sugar dissolves completely, add cardamom powder and bring it to boil by stirring every now and then. Let the sugar syrup thicken slightly, about 2-3 minutes after coming to boil. You don’t need to boil it until it reaches one thread consistency. Turn off the flame and run the sugar syrup through fine sieve to remove any impurities. Transfer the sugar syrup back into the wide pan and mix in saffron and rose water if using. Let it cool down to room temperature. 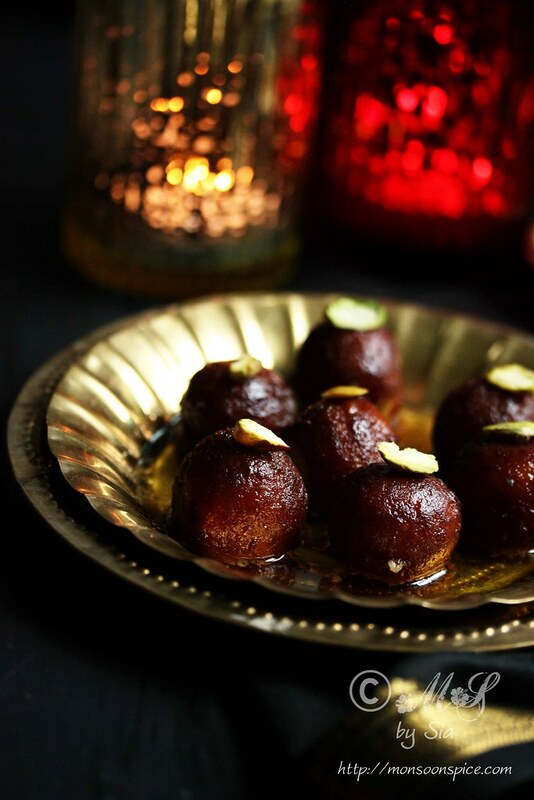 While the sugar syrup is cooling down, prepare the Gulab Jamun mixture. Sieve milk powder, plain flour, baking soda and salt into a mixing bowl. Mix in yogurt or milk and ghee/oil and start to mix the ingredients lightly to make soft sticky dough. I didn’t need to add more than a tbsp of yogurt and a tsp of ghee but if you find the mixture too dry and crumbly, just add little yogurt or milk about ½ tsp at time until you get a sticky soft dough. Make sure that you don’t over mix or knead the dough as we don’t want the gluten to form. The plain flour used acts as a binding agent and if you over mix the dough then the gluten formed will make the mixture dense and the gulab jamuns will not absorb the sugar syrup well. Grease your palms with ghee or oil and pinch marble sized dough and roll it into smooth round or oval shaped balls. Make sure that the balls are small as they double in size once they are fried and soaked in sugar syrup. Keep in mind that the dough balls should be smooth without any cracks as they will split and crumble when deep frying. Arrange the balls on a plate and cover it with a kitchen towel to prevent from drying out. Heat oil in a pan for deep frying the gulab jamuns on medium flame and then reduce the flame to low. To test if the oil is hot enough, drop one ball into the oil. The dough ball should slowly float to the surface of the oil. If the dough ball sinks to the bottom and stays there, then the oil is not hot enough. If the dough ball quickly floats to the top as well as browns quickly, then the oil is too hot. Gently drop 3-4 dough balls into the hot oil and stir with them with a slotted spoon so that they get evenly browned from all the sides. Be careful when stirring them with slotted spoon as they are quite soft and can break if you are not gentle. Once they turn golden brown, remove them from oil with a help of a slotted spoon and transfer them to the prepared sugar syrup. 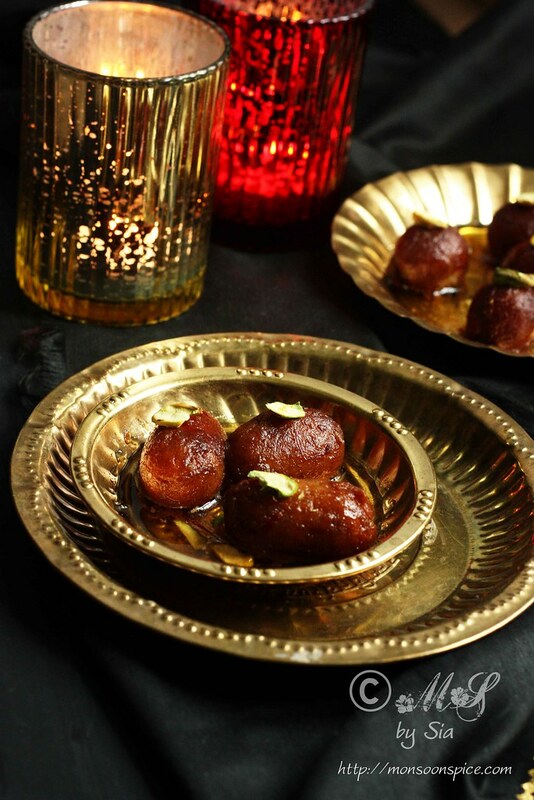 Prepare all the Gulab Jamuns and let them rest in the sugar syrup for at least 1 to 2 hours before serving so that they absorb the sugar syrup well and become soft and melt in mouth treats. 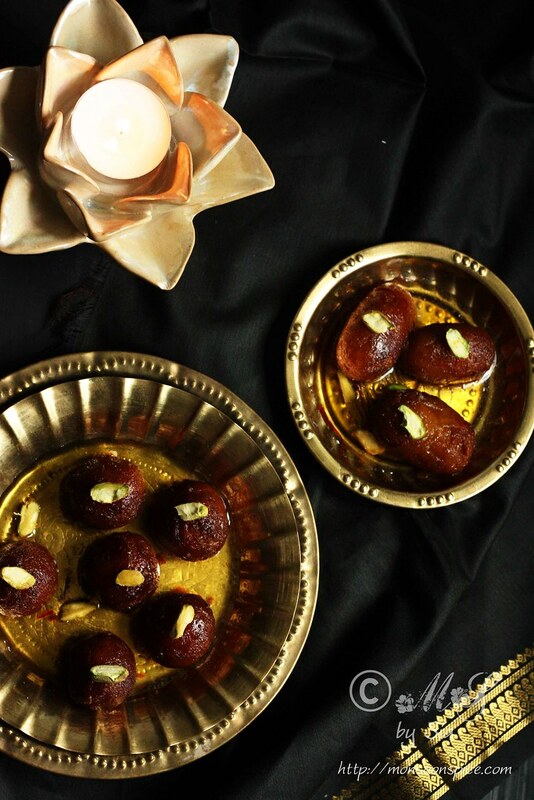 You can serve these delicious melt in mouth Gulab Jamuns warm, cold or chilled on their own, garnished with slivered almonds or pistachio and a generous spoonful of sugar syrup drizzled on top. One other most enjoyable way to serve them is warm with a scoop of cold vanilla ice cream! Heaven! I didn’t need to add more than a tbsp of yogurt and a tsp of ghee but if you find the mixture too dry and crumbly, just add little yogurt or milk about ½ tsp at time until you get a sticky soft dough. Make sure that you DO NOT over work or knead the dough as we don’t want the gluten to form. The plain flour used acts as a binding agent and if you over mix the dough then the gluten formed will make the mixture dense and the Gulab Jamuns will not absorb the sugar syrup well. Make sure that the balls are small as they double in size once they are fried and soaked in sugar syrup. Also keep in mind that the dough balls should be smooth without any cracks as they will split or break and crumble when deep frying. To test if the oil is hot enough, drop one ball into the oil. The dough ball should slowly float to the surface of the oil. If the dough ball sinks to the bottom and stays there, then the oil is not hot enough. If the dough ball quickly floats to the top as well as browns quickly, then the oil is too hot. Gently drop 3-4 dough balls into the hot oil and stir with them with a slotted spoon so that they get evenly browned from all the sides. Be careful when stirring them with slotted spoon as they are quite soft and can break if you are not gentle. 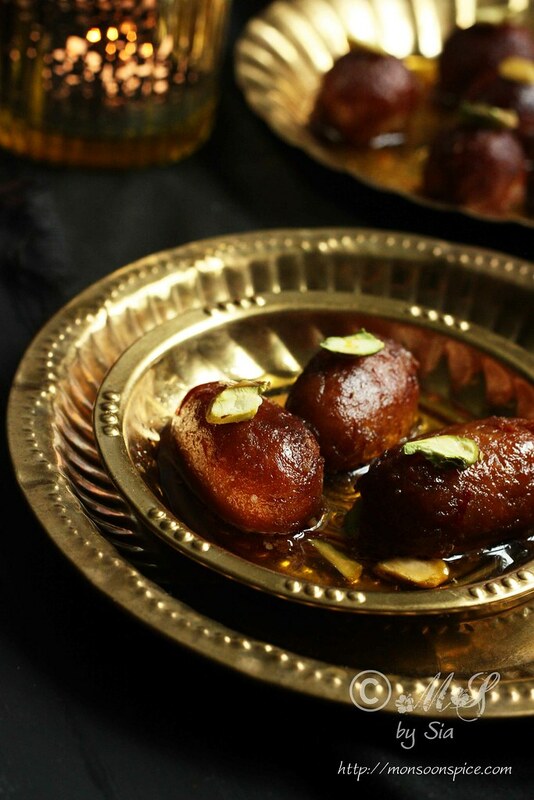 The Gulab Jamuns should rest in the sugar syrup for at least 1 to 2 hours before serving so that they absorb the sugar syrup well and become soft and melt in mouth treats. An extremely tempting treat! Happy Diwali. 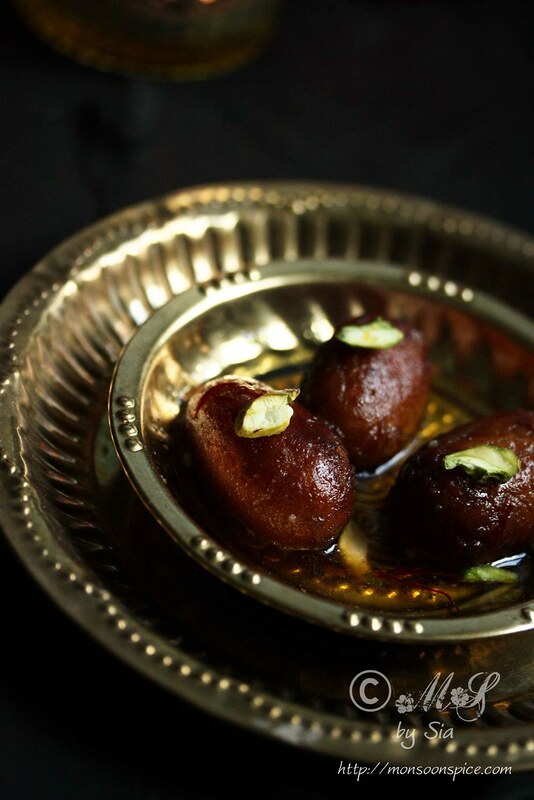 Gulab jamun looks very tempting and I loved the colour. I always buy ready made mix. I will try this recipe. Can I use baking powder instead of baking soda? Whats the difference actually? Nice recipe Sia. 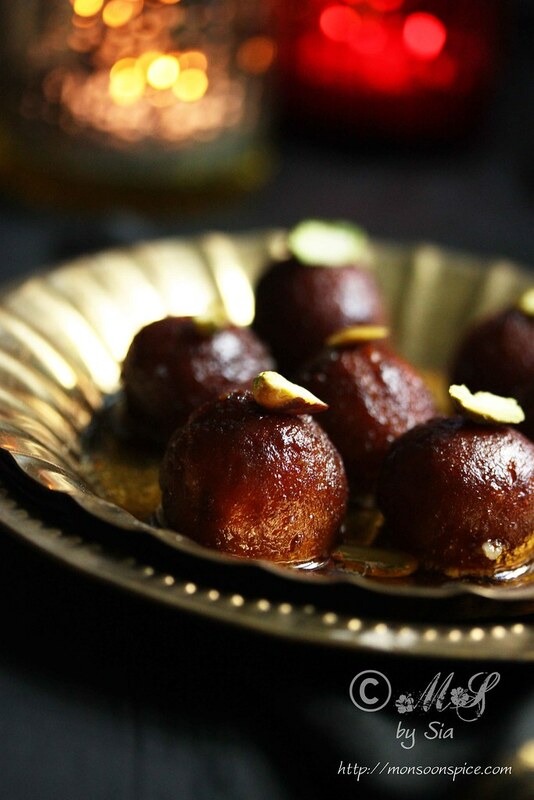 I am gluten free and its been so long since I had gulab Jamun...will try these by subbing gluten free instead of APF and see how they turn out. Looks delicious. Love the memories. i have tried making these in the past, not this recipe though, but it browned really quickly and was thus raw'ish in the middle. guess practice makes perfect. @Ousna Toonah, I am sorry to know that. The proportions given above always workd for me if I follow the recipe to T. You can try increasing the baking soda from 1/4 tsp to 1/3 tsp and see if it works. Unlike the one made using khova, this one uses milk powder and it browns quickly. So you need to cook it on low-medium flame to cook inside out or else the outer layer will brown quickly leaving the insides raw. Very nice explanation and pictures. Gonna try this out..